New Delhi, Feb 9 (IANS) India’s FDI policy on e-commerce and mandatory data localisation for global card payment companies seems to have rubbed Donald Trump on the wrong side as the US is thinking about withdrawing zero tariffs for India, sources said. 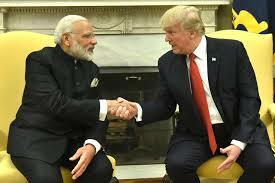 The US Trade Representative is reviewing the preferential arrangement for India wherein the US charges no tariff on certain exports from India to the US under the Generalised System of Preferences (GSP) and may soon withdraw the benefit, said an official. The move is seen as a retaliation by US President Donald Trump after India revised its FDI policy on e-commerce banning online retailers like Amazon and Walmart-owned Flipkart from selling products of companies in which they have stakes from February 1. The online retail firms (e-commerce marketplace entity) were also prohibited from mandating any company to sell its products exclusively on its platform only, as per the revised policy. Trump, who is working towards reducing trade deficits with major economies and asking US manufacturing companies to return home as part of his Make America Great Again campaign, is also not happy with the data localisation policy of India, the official said. The Reserve Bank of India (RBI) guidelines say that all foreign payment companies such as MasterCard and Visa must store data locally for their businesses in the country. US Commerce Secretary Wilbur Ross is likely to raise the issues of e-commerce norms and data localisation in his visit to India next week. Currently, about $6 billion of exports from India get the special treatment of zero tariffs under the GSP. The GSP is a US trade programme designed to promote economic growth in the developing world by providing preferential duty-free entry for up to 4,800 products from 129 designated beneficiary countries and territories.